Over the years, Belgian musician Dirk Serries has turned his Fear Falls Burning project into a one of a kind entity. Starting of in 2005 as an exercise in minimalism, records such as the unforgettable Frenzy Of The Absolute, not to mention remarkable collaborations with Final or Year Of No Light, have plunged us into the darkest depths of sound itself, awash with through waves of drone, ambient and an inventive use of pedal effects. 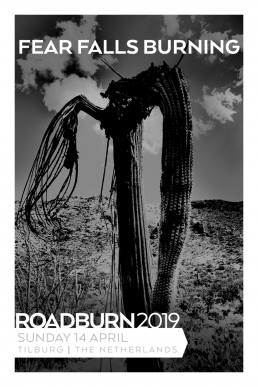 At Roadburn 2019, Dirk will be joined by a famous gang with many connections to the festival: wild saxophonist Colin Webster (who performs regularly with Dead Neanderthals), powerhouse drummer Tim Bertilsson (Switchblade) and keyboardist extraordinaire Per Wiberg (Spiritual Beggars, ex-Opeth). We have also heard a snippet of a future new album, and we’ll tell you all about it… when our hearing gets back to normal. You might want earplugs for the Fear Falls Burning show when they play the Het Patronaat on Sunday, April 14.